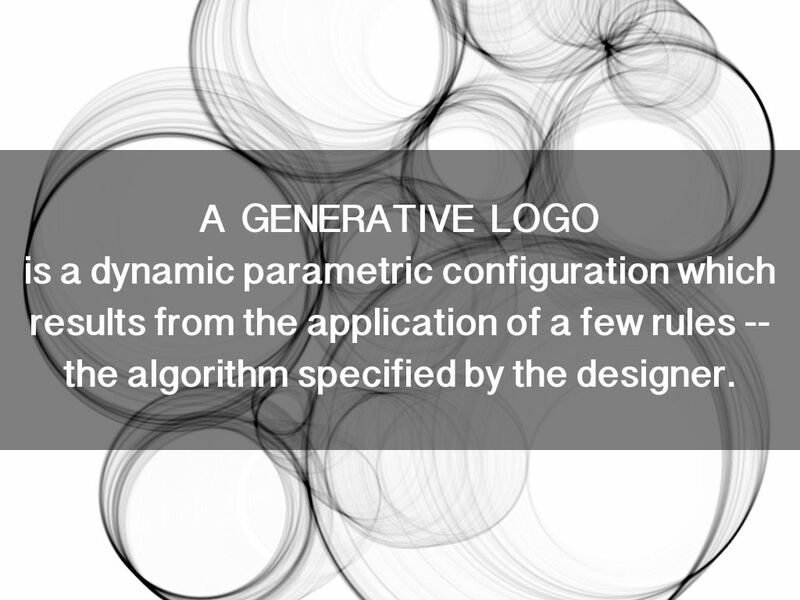 is a dynamic parametric configuration which results from the application of a few rules -- the algorithm specified by the designer. 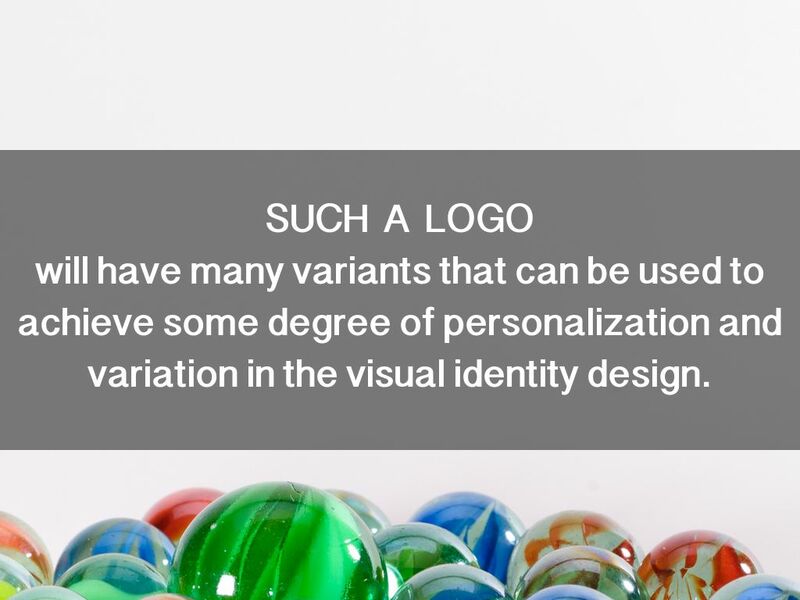 will have many variants that can be used to achieve some degree of personalization and variation in the visual identity design. 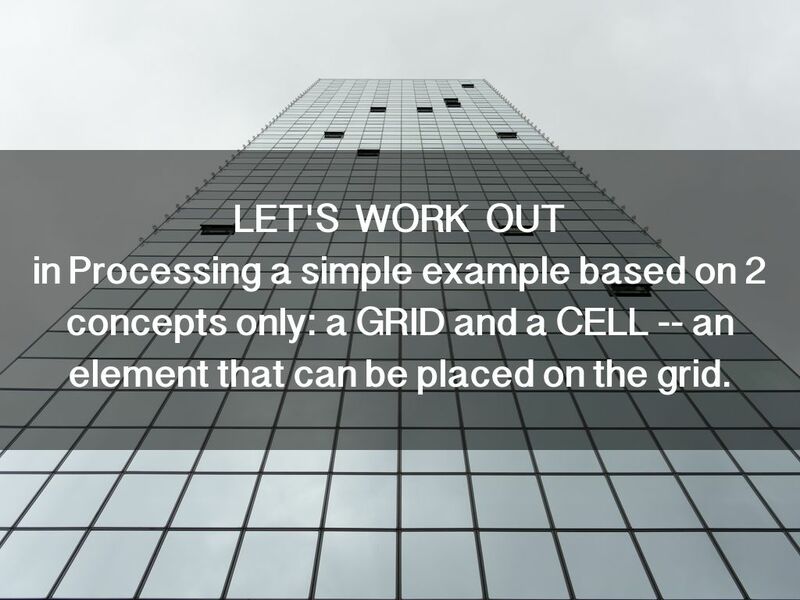 in Processing a simple example based on 2 concepts only: a GRID and a CELL -- an element that can be placed on the grid. 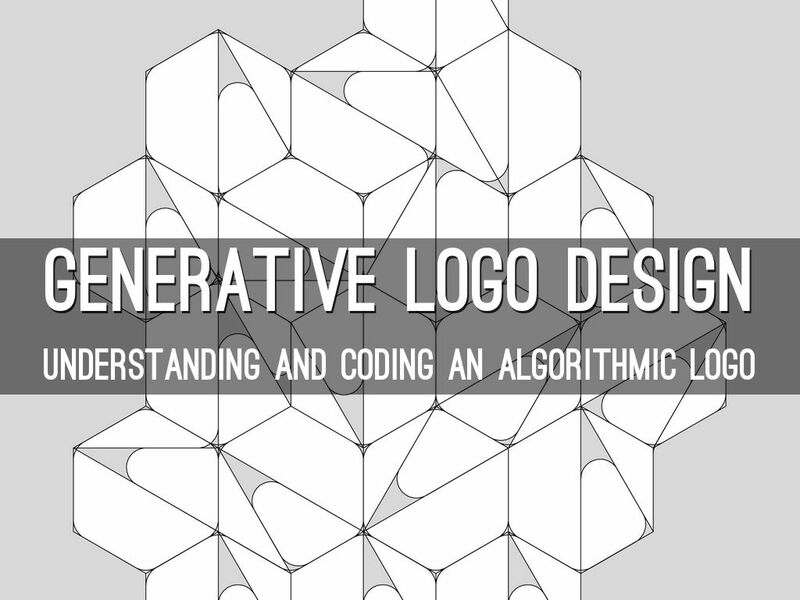 Set up the main parametric values. 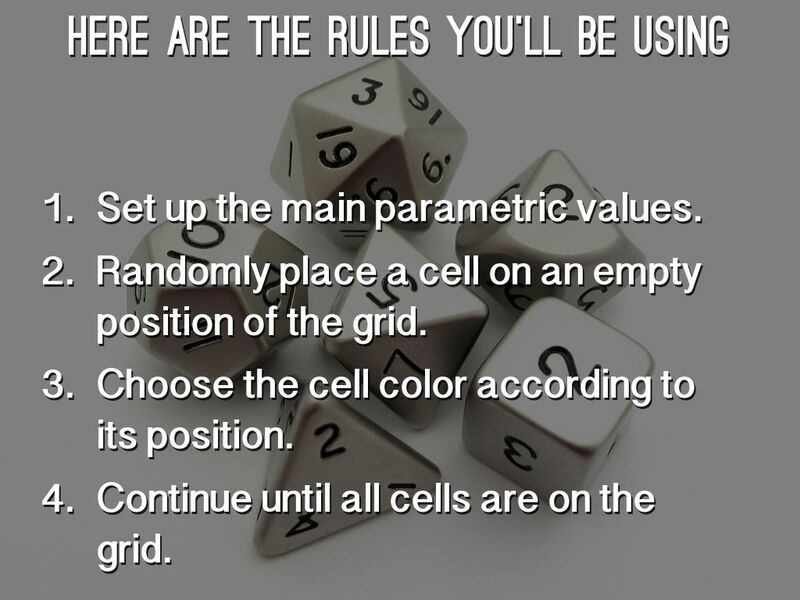 Randomly place a cell on an empty position of the grid. 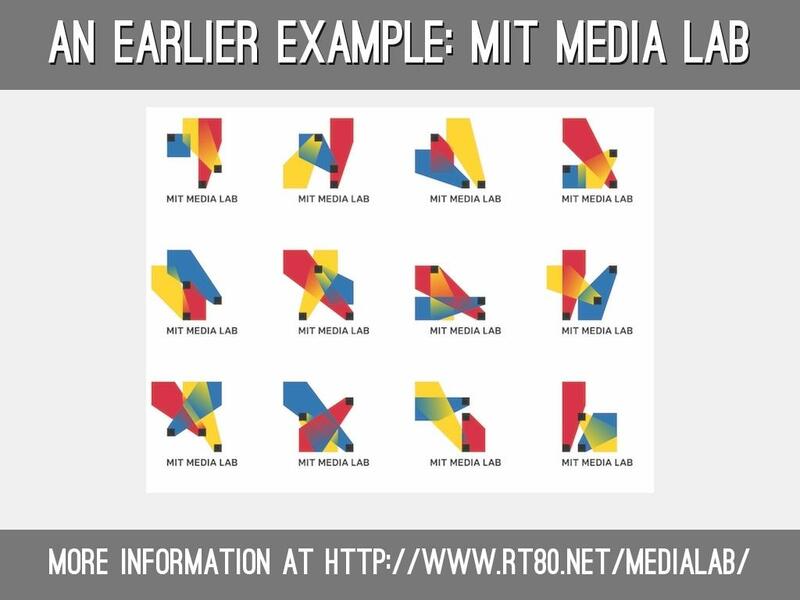 Choose the cell color according to its position. 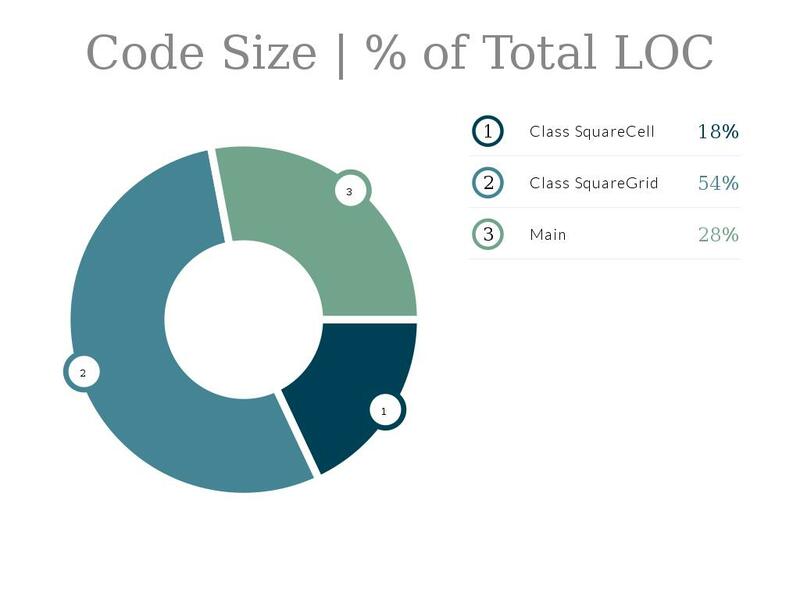 Continue until all cells are on the grid. 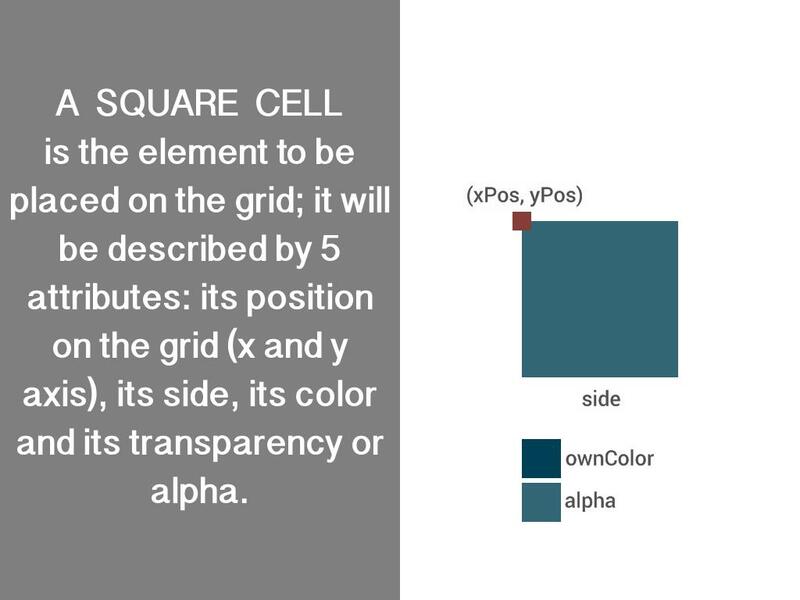 is the element to be placed on the grid; it will be described by 5 attributes: its position on the grid (x and y axis), its side, its color and its transparency or alpha. 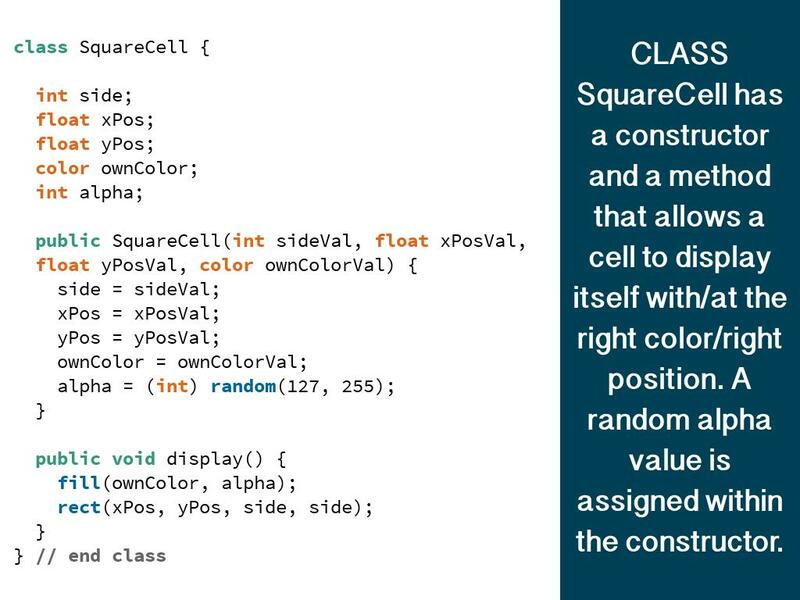 SquareCell has a constructor and a method that allows a cell to display itself with/at the right color/right position. A random alpha value is assigned within the constructor. 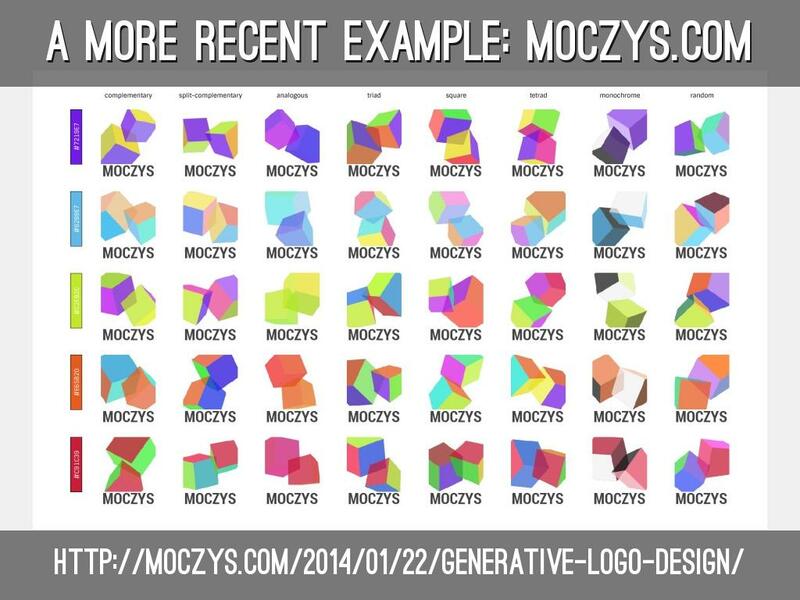 will be described by 8 attributes: its origin (x and y axis), size, cell padding, cell side, primary and accent colors, and a flag -- TRUE if a position is filled with a cell, FALSE otherwise. 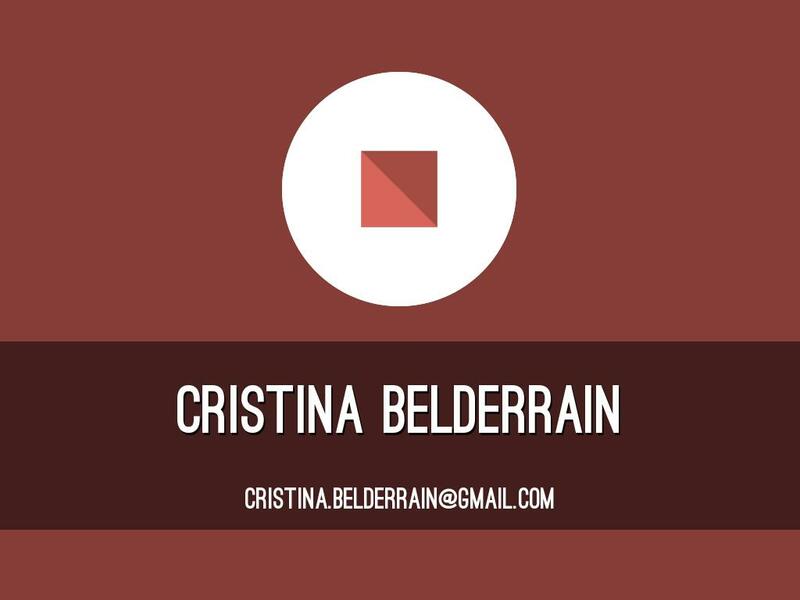 SquareGrid is a bit longer. Here you see the attributes and the constructor. 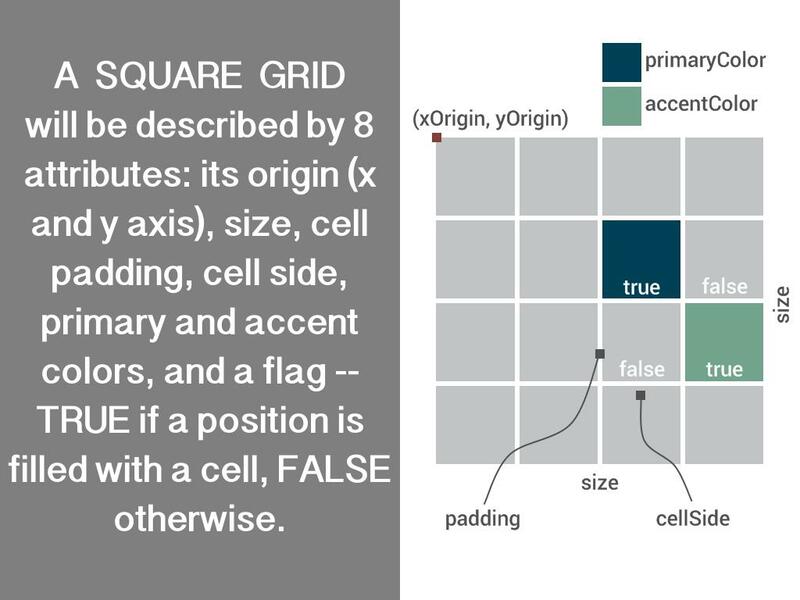 The grid origin depends on the cell side. 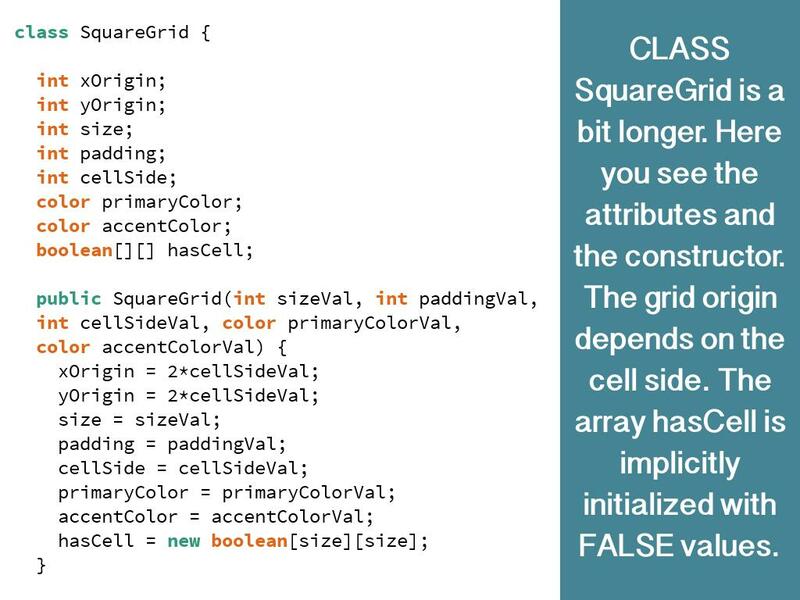 The array hasCell is implicitly initialized with FALSE values. 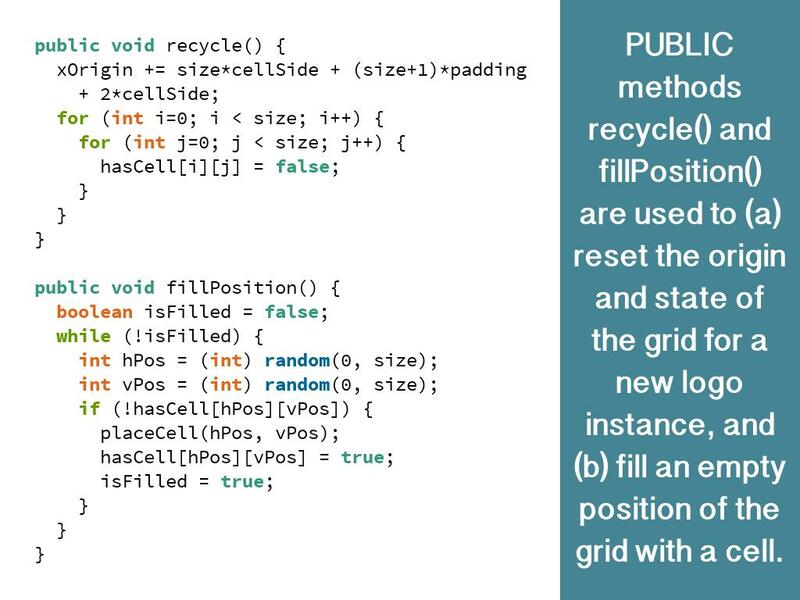 methods recycle() and fillPosition() are used to (a) reset the origin and state of the grid for a new logo instance, and (b) fill an empty position of the grid with a cell. 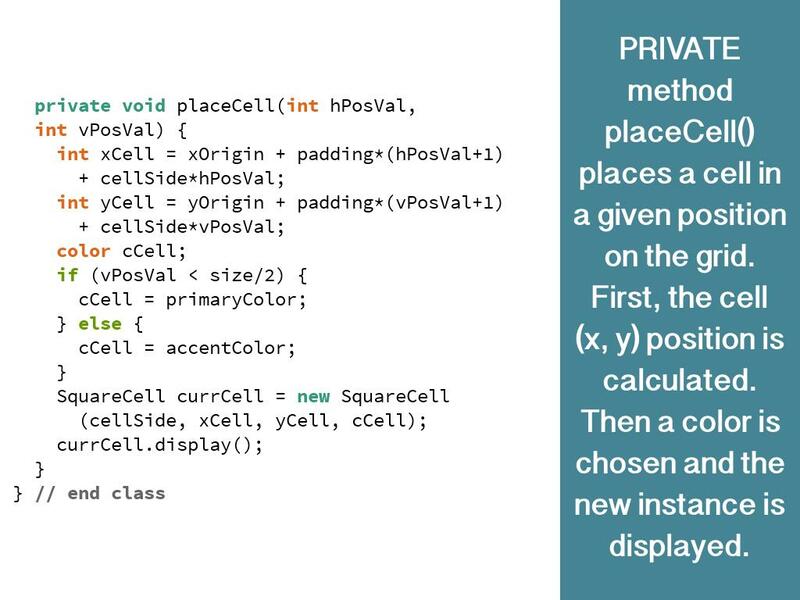 method placeCell() places a cell in a given position on the grid. First, the cell (x, y) position is calculated. 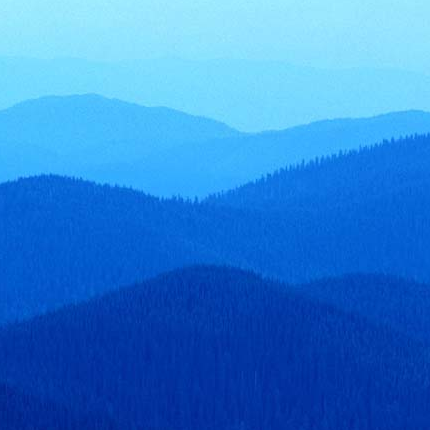 Then a color is chosen and the new instance is displayed. 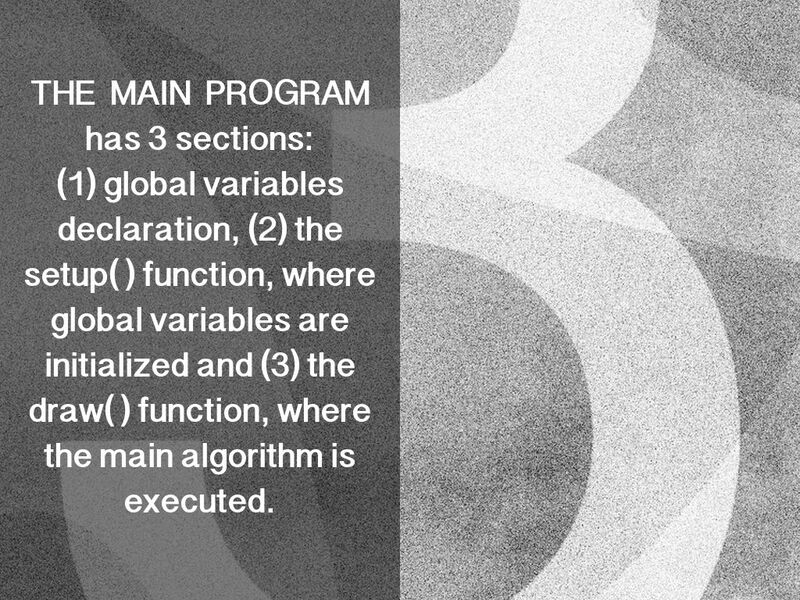 (1) global variables declaration, (2) the setup( ) function, where global variables are initialized and (3) the draw( ) function, where the main algorithm is executed. 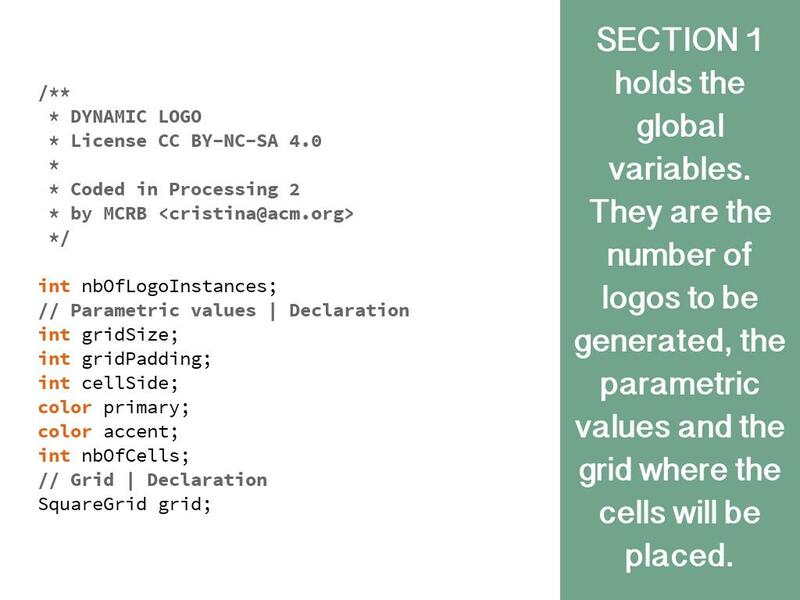 holds the global variables. 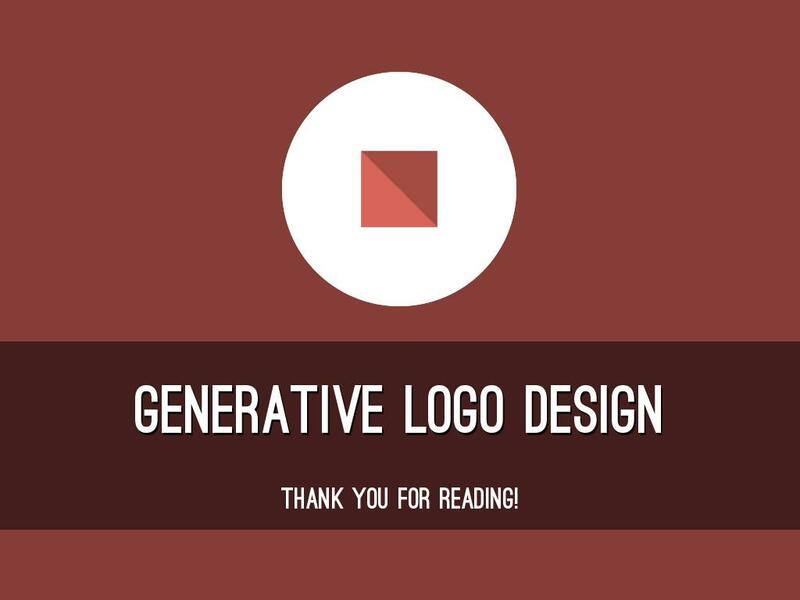 They are the number of logos to be generated, the parametric values and the grid where the cells will be placed. holds the setup() function. 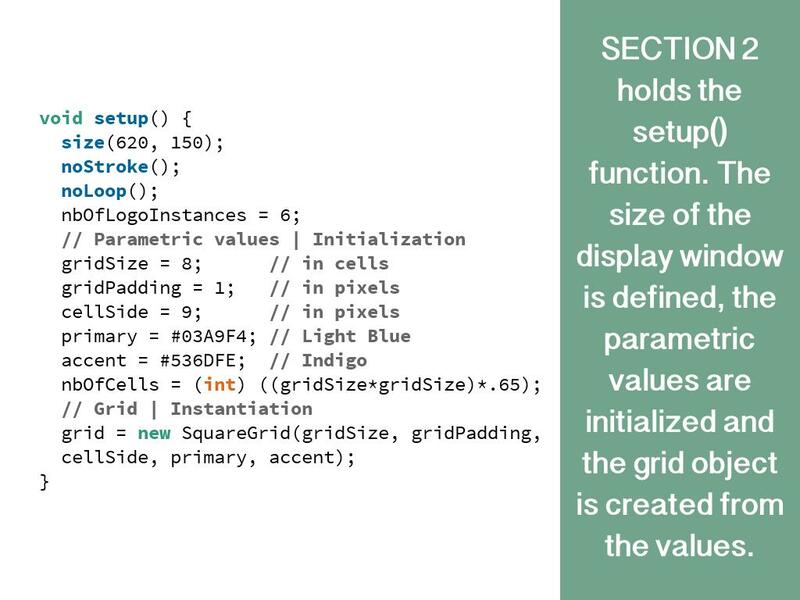 The size of the display window is defined, the parametric values are initialized and the grid object is created from the values. 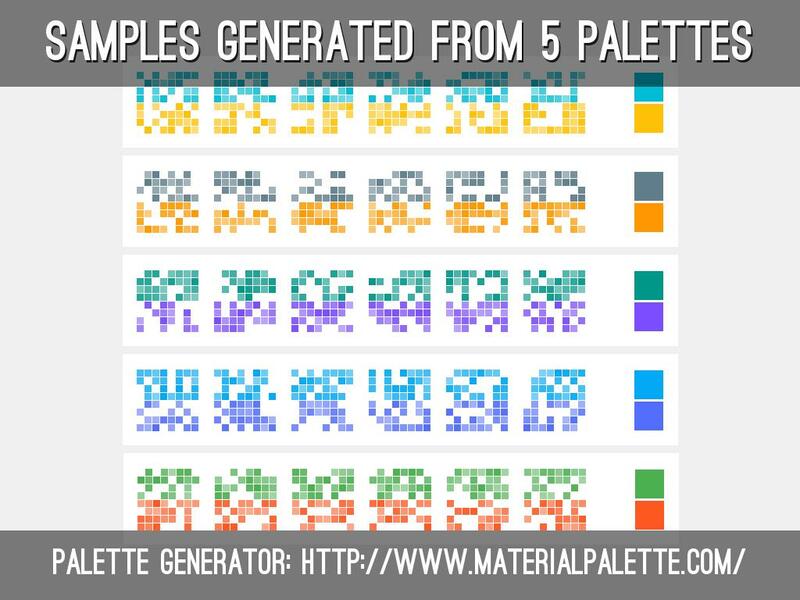 holds the draw() function. 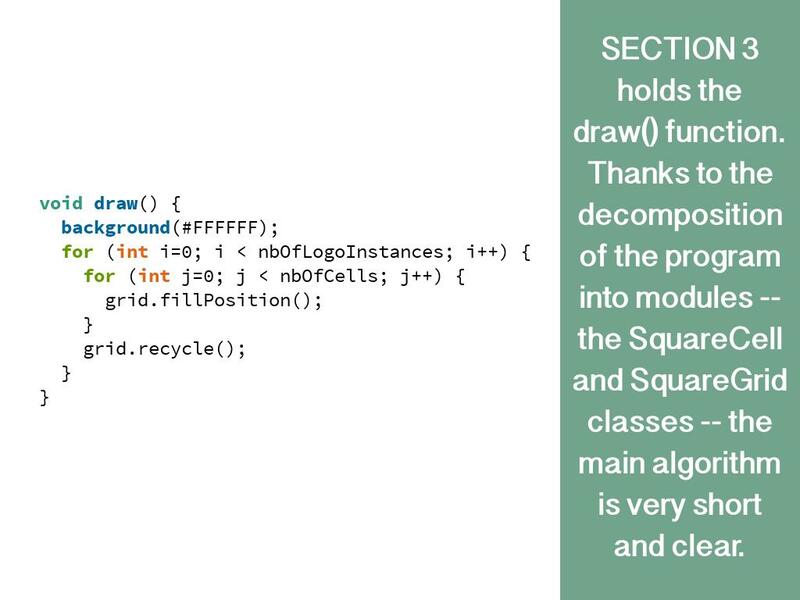 Thanks to the decomposition of the program into modules -- the SquareCell and SquareGrid classes -- the main algorithm is very short and clear. 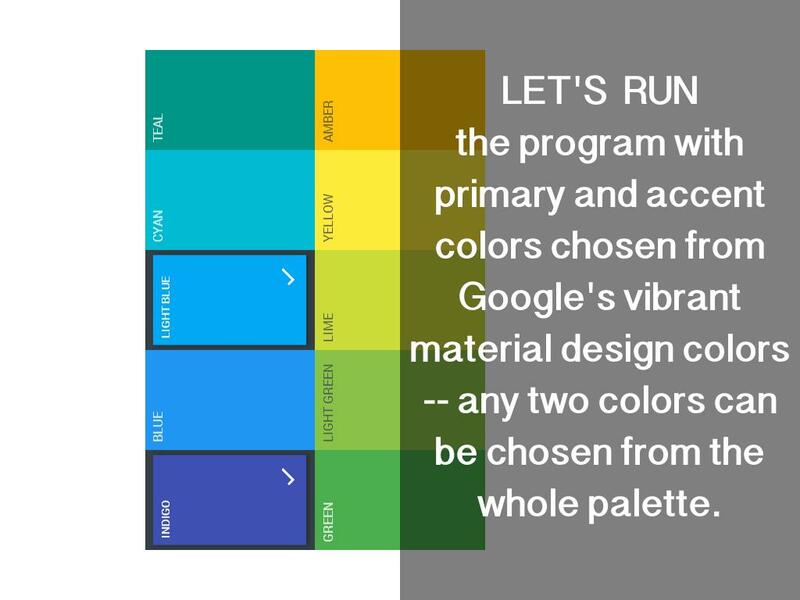 the program with primary and accent colors chosen from Google's vibrant material design colors -- any two colors can be chosen from the whole palette. 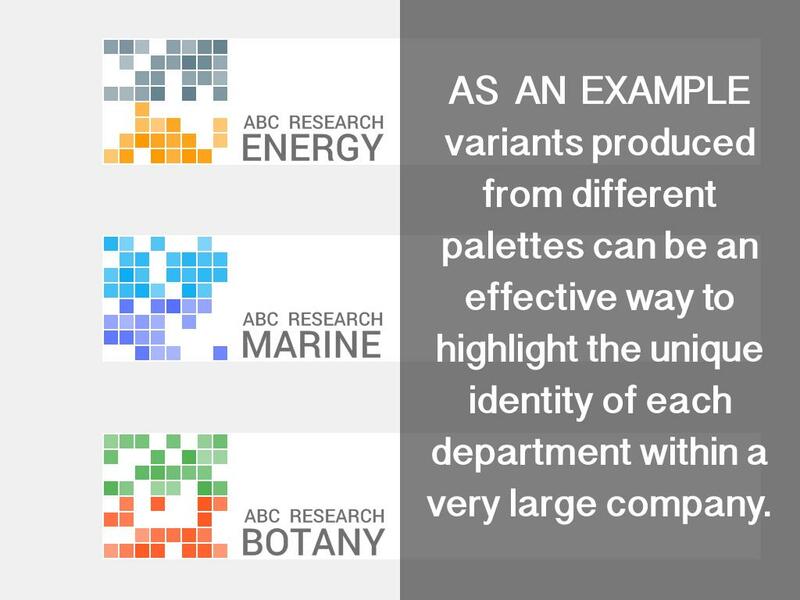 variants produced from different palettes can be an effective way to highlight the unique identity of each department within a very large company. 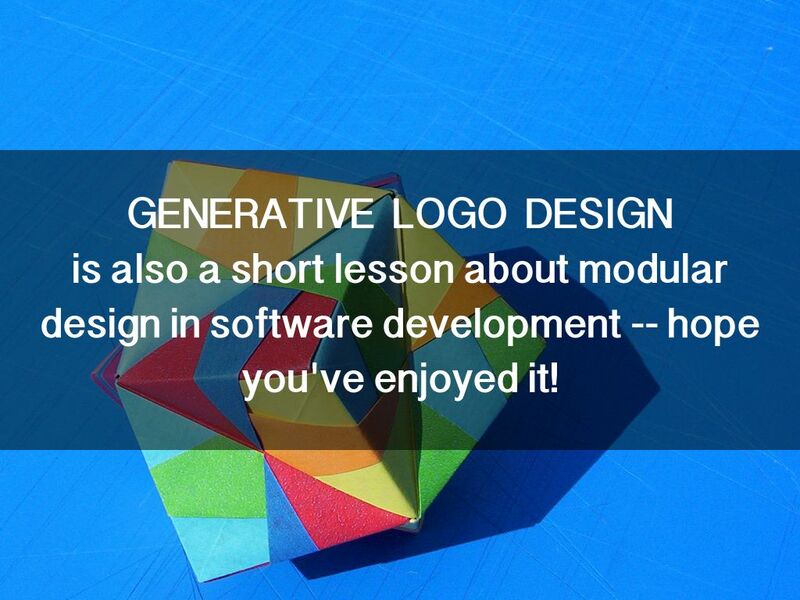 is also a short lesson about modular design in software development -- hope you've enjoyed it!